Needless to say, my curiosity was piqued. I found pictures of a greenish, basketball-sized mace, covered in spikes; I read accounts of harvesters suffering concussions and bloody head wounds from falling fruit. But what compelled me most was the smell. The fact is that nothing has brought out disagreeable descriptions in culinary writing quite the way the durian has. Its scent has been compared to turpentine, gym socks, civet, and sewage; it is banned from many Thai and Indonesian hotels, despite its local culinary popularity. That’s right, people eat it – and love to! In fact, Thailand holds an annual durian festival, celebrating the fragrant fruit. Its taste is described with intense variety, comparisons ranging from onion sauce to almonds to vanilla ice cream. 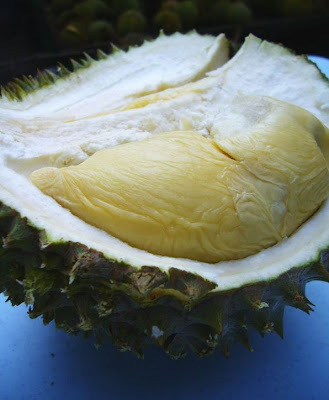 These gulfs of opinion are widened by the differences in durian varieties; indeed, culinary use does nothing to illuminate the true nature of this fruit, for while it is prepared in savory sauces in Sumatra, in the Philippines it is used exclusively for desserts such as cakes and candy. Of course, I was absolutely besotted with the idea of experiencing a food compared to eating "blancmange in a lavatory.” But where would I find one? Wikipedia assured me that durians had made their way to Western markets – mellow breeds whose scent could be contained by careful packaging – and that I could find them in “specialty markets” for five dollars a pound, or about $25-35 each. I skipped the specialty markets and headed straight for that den of strange fruits, Chinatown. I found litchis, dragonfruits, more mangosteens, and a dozen other things I didn’t recognize – but no durians. A year went by, and the durian lingered in my subconscious like a banana kicked under the fridge. I even forgot what it looked like, but preserved the desire to experience this powerful, evocative food. Which must be why yesterday, I found myself standing outside a bodega on Canal street, staring down into a box of football-shaped plastic bags, and having a sudden thought: could there be durians in there? The shopkeeper didn’t know the English word for what was in the bag, but my nose confirmed that this must be it – my elusive durian. I paid her six dollars for the five-pound fruit, which she carefully double-bagged after wrapping it in several layers of newspaper. I was relieved, if a little disappointed, that mine was your American-market-variety durian; nobody looked at me funny or changed seats on the train. I could smell it in my lap, through the layers of paper and plastic, but it wasn’t an unpleasant smell, really – sort of like an aging jack-o-lantern filled with bananas, with maybe a slight hint of morning-breath. No civet, though, and definitely no sewage. An hour later, the barbed obscurity lay prone on my cutting board, and, poised to slice, I realized I didn’t really know what to expect. Would it be like a pineapple inside? Like a kiwi, or a coconut? Would juice spill out? Would there be a constellation of little seeds, or a giant pit like an avocado or a peach? I sawed cautiously through the spiny armor and pulled back a wedge of the inch-thick hide. It made a sucking sound, revealing…what? I’m going to be candid. Durian flesh looks like organs. Like a pancreas, actually, or a liver, if a liver were a buttery yellow color. I slid my hand under the “pod” of durian meat, and as I lifted it out of the husk, I had the distinct sensation of dissecting a body. Mesmerized, I laid the slick, yellow mass on the counter and split open its thin membrane. A creamy custard oozed out, pudding-like, vanilla-colored. This wasn’t like any fruit I had ever seen before – not even an avocado or a mashed banana comes close to this pure, decadent texture. The scent became more complicated, sweeter, but still carrying undertones of that strange musk. I dipped a finger in and spread the yellow cream on my tongue. Crème brûlée without the brûlée, was my first reaction. My second reaction was something like, Holy crap! I’m comparing something that smells like compost to my favorite dessert!. Vanilla ice cream, banana milkshake…I could not have been more astonished – durian tastes good! Really good! It makes me overuse italics! I sampled another dollop of the sweet custard. This time I experienced more of the odor, and the flavor, though still predominantly vanilla-banana with maybe just a touch of onion, was less satisfying. In fact, with each subsequent nibble – though still charmed by this strange fruit – I became less certain that I had discovered the new Eden. In the center of each buttery node I found a soft, pliable pit, ostensibly edible when cooked (or so claims Wikipedia). I wrung the flesh into a bowl, discarding pits and pulp; I gently strained the resulting mass through a fine sieve, and marveled at the velvety, sunshine-yellow pudding – some two cups or more – that remained. And then I had no idea what to do with it. The idea of eating more of it was unappetizing. I put it in the freezer. My retrospective analysis of durian is inconclusive. Was it good? I’m not sure. But it was completely, entirely new – and I find that the more of a foodie one becomes, the rarer those experiences are. Like the first time you try cardamom or bleu cheese ice cream or truffles, that strange, wonderful newness sates your palate, changes you a little. Unlike cardamom and truffles, however (say what you like about the ice cream), durian’s reputation is a site for struggle that’s full-out theatrical – not allowed indoors by some, celebrated in festivals by others, the durian has long stood as a symbol of the subjectivity of beauty and ugliness. An Indonesian saying, translated as “getting a fallen durian,” means receiving unforeseen good fortune; nevertheless, standing under a tree full of ripe durians remains inadvisable. So, I have plans to make ice cream with it later, maybe, or durian crème brûlée…or…does anybody need any fresh-squeezed durian? P.S. This is my 100th post! I am so grateful, everybody, for your readership, love, and support over the past two years. Pie in the Sky has been a life-changing creative space for me, and has given me access to a whole world of online friendships that I am continually blessed by. You all mean so much to me. Thank you!!! This is so interesting! I was simultaneously nauseated and tempted to try durian, haha. Your posts never cease to amaze me! here's a bit of durian related info for you. josh and i heard on NPR some time back (last summer, perhaps?) that there is a scientist in asia who is genetically breeding a stink-free durian. some people (like american and european chefs who work in asia and in other parts of the world) are really excited about the stink free durian. a lot of the people who grew up around durians and whose families have grown or eaten durians for generations, though, are very upset because they feel that the durian without the stink is not a durian at all. It is funny you posted about this...just a couple weeks ago we were talking with some employees of the local organic farm who were singing the praises of durians. A chef from Miami who is a regular customer at the farm would often bring them by the case for the farm staff. They loved it and promised that eventually they would bring one for us to try. Very interesting. Very interesting stuff. My roommate is 75% Vietnamese, and he introduced me to this delightful fruit - I love it. Try blending it with some fresh young coconut and frozen fruit for a delicious pudding/shake. Durian isn't a cousin of mangosteen anymore than you are a cousin of a starfish. They are both fruiting plants but they are rather distantly related (and mangosteen is an oddball fruit as it is never pollenated but instead clones itself). Processing and freezing a whole durian is kind of like buying a peach, smashing it, straining out the skin and pit, then freezing it- sure you can do it but it isn't going to improve the experience. Sadly all the durians I've seen in the US are frozen at least during shipping. It breaks up the texture of the fruit and homogenizes the flavor/ I've heard NY NY gets fresh ones but I kind of doubt it (as USDA is very skeptical about tropical fruits). In Canada (Toronto especieally) it is very easy to get whole fresh (never frozen) durians, or even segements of them. But then you can buy a mind boggling variety of tropical fruits there (even if you just stick to the corner of Spadina and Dundas). Here in the DC area we don't get a lot of exotic tropical stuff: rambutan, june plum, queenpa, lytchee, longan, wax jambu, and sometimes jakfruit, white sapote, monstera. Asian markets do carry frozen mangosteen, santol, salak...; but who eats frozen fruit? I was very interested in your durian description. I just joined a health club that has an durian, mangosteen, acia, and blueberry as a health drink. My drink doesn't have any bad odors. It kind of taste like a banna mango smothie. Does Durian realy improve “irrepressible libido.” where does that information come from?